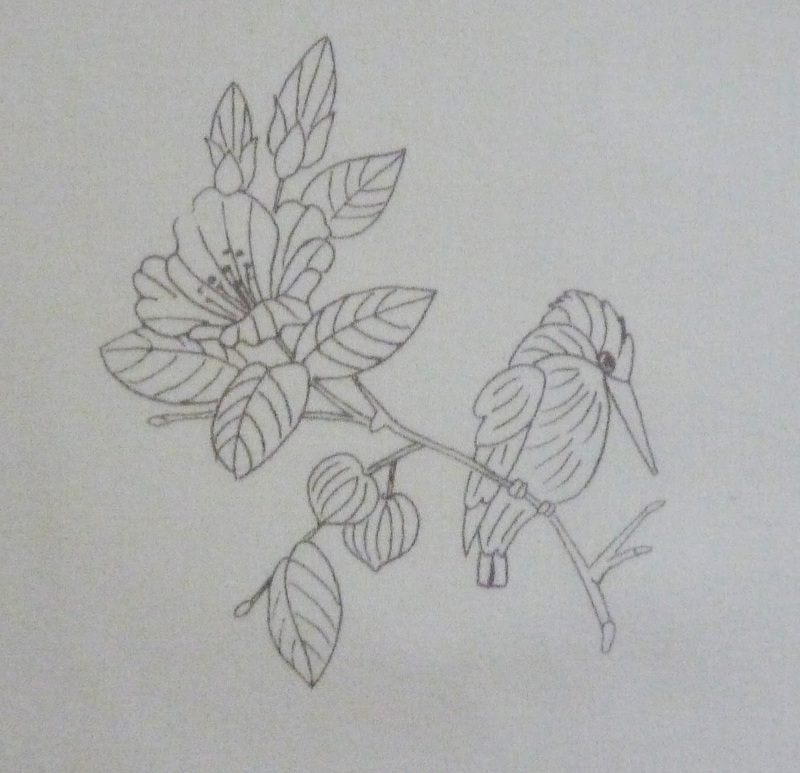 I've finished the last two leaves which are part of Lesson 4 of the Chinese Flower Project. It's really coming along nicely. These two leaves are similar in color to the sepals of the buds, and completely different from the previous three leaves. These had a more dusty color to them. Next up are the two little nut shaped things, which are called lanterns. Why, I have no idea. After that, I tackle the kingfisher in the last two lessons. And no, I didn't get up at 3 am yesterday morning to watch the Royal Wedding, but I did spend a considerable amount of time watching the videos on the computer. What a spectacle it was! It was nice to see the interior of Westminster Abbey and realize we had just been there a month ago. 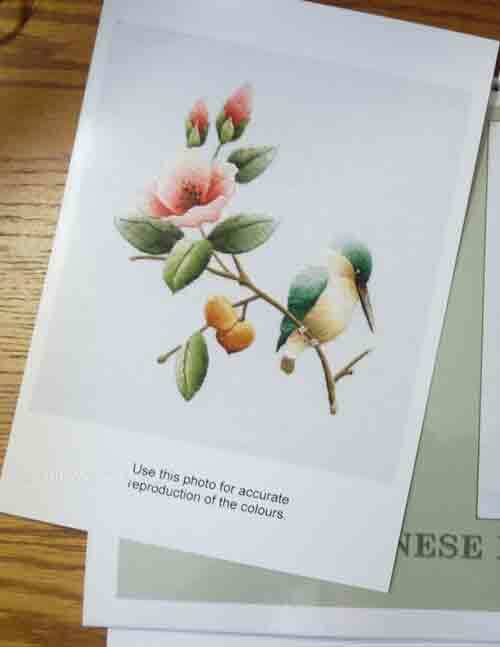 Many of you have been following my progress with the Chinese Flower Project, an online correspondence course with Trish Burr. She has just announced on her blog that she will be holding another class starting June 30, with registration on May 30. If you remember, the class I am in filled up after one day! So if you're interested, visit Trish's blog and send her an email. She has the picture of the same project I'm working, so I assume it's the same course and she's offering it again to give others a chance to take it. The project is worked on cotton fabric with Anchor floss, although she does offer a DMC conversion chart if you prefer using the more readily available (at least in the US) DMC floss. Even though I have a complete set of DMC floss I decided to spend the money and purchase the Anchor floss so I could follow the color changes exactly. I'm glad I did, as we have to blend up to six shades in one small object, and it's pretty difficult to see the exact color changes. Well, that's the whole idea with shading, isn't it? I don't know if I would have had more difficulty with the DMC floss, but I decided I didn't want to take the chance. It cost me approximately $37 to purchase the Anchor floss, with two trips to Laguna Beach to the yarn shop that carries them. I could have bought them online, but it's always nice to drive to the ocean. It's not even 10 miles away and only takes about 20 minutes, so it's not a big time investment. If you'd really like to see all of my postings on the project, just click here and they will be in reverse order, with the recent one first. 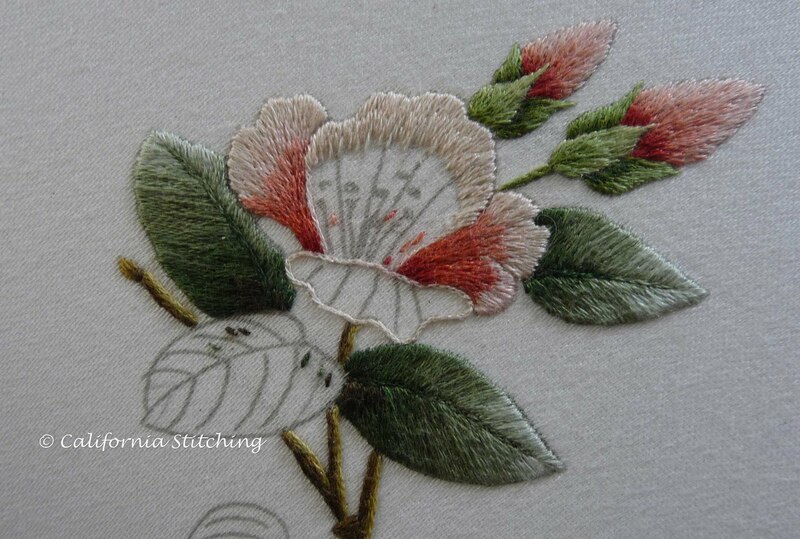 I've redone the first two rows of stitching on the Chinese Flower Project using Anchor 101 on the large petal and I have to admit it's looking better. In my last post somehow I made the stitches two short and ended up with three rows to get the required depth. I didn't like the way they looked and ripped them all out. In this photo you can see I've added two more shades, Anchor 6 and 9, and have blended it in carefully. This shows the darkest shades, Anchor 10, 11 and 1025. I don't know how on earth our teacher, Trish Burr, manages to pick out these shade so well. I have trouble with color, but she can see them beautifully! All of the colors, from the lightest to the darkest, shade into each other so well. 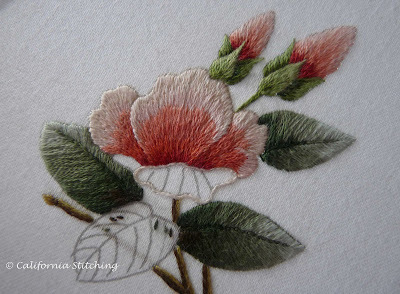 I've added the stamens in 905 and completed the lower petal. Overall, it doesn't look too bad. My assessment came back saying that my first row, Anchor 1011, isn't as full as it could be, which gives me little pepper marks where I've pushed aside the threads to allow the needle through. If the threads were packed closer together, this wouldn't happen. This is usually caused by going down into the threads with the needle, instead of coming up through them, but I didn't do that. I fact, I was very careful to come up through the threads. So the solution seems to be to pack them in more tightly. 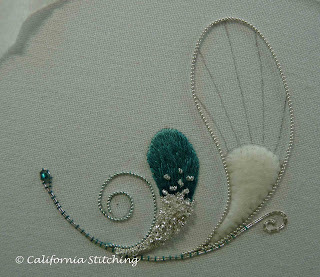 If this sounds confusing, I'll try to photograph it while I'm stitching Lesson 4. I had high hopes for getting in several hours of stitching yesterday, and I did! 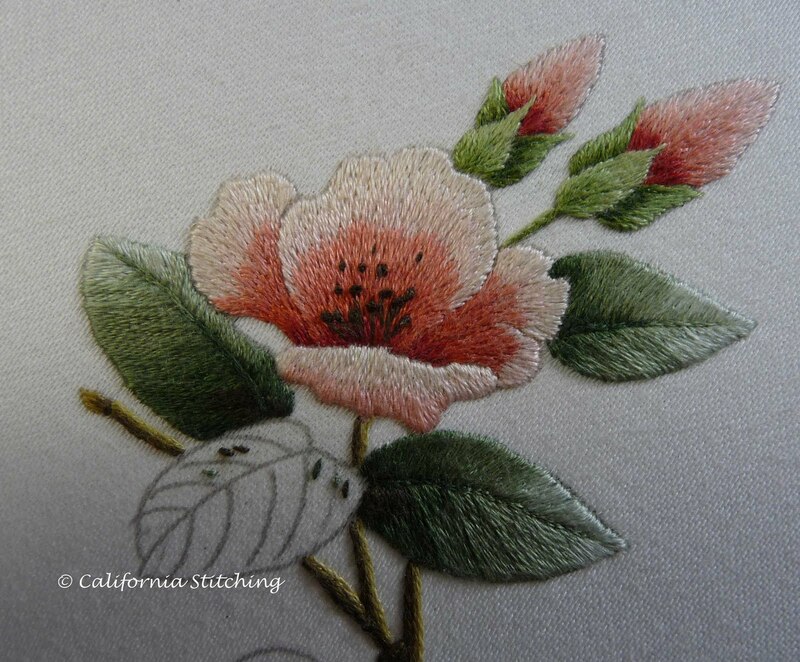 I managed to reach this stage, with the lightest color, Anchor 1011 on the tip of the main petal, and a few stitches of the next color, Anchor 6 in to show stitching guidelines. The instructions said to stitch two rows of 1011, which I did, but when I looked at it I realized I needed another row to give it the proper depth. Two rows are required when graduating from a fairly wide area to a narrower on. So I added a third row, but didn't like it one bit. I got up, walked around, worked in the garden a bit, then came back to the sewing room and decided to rip all the stitching out. I took my trusty seam ripper, ripped through all those lovely stitches, and took them all out carefully with tweezers. Extremely frustrating, but I feel as though I've done the right thing. I want this to look good! After all, why bother to take a course and have your work evaluated if it isn't the best you can do? I managed to get the stitches out with minimum damage to the fabric, dabbed a bit of water on it, and will let it sit overnight. I hope the water will relax the fibers and close up any stitching holes that may linger. If I get some time to work on it today, I'll post the much better looking (I hope!) stitching. And the next blended in. As you might be able to tell, I'm taking much more care with blending on this lesson. That's because I think I made the buds a bit too light colored. You can compare my blending with the finished photo of Trish's sample. I may blend a bit more of the darker shades into the light colored areas now that I can see the two outer petals finished. The third outer petal on the right has been a real challenge. I started with the very lightest thread, Anchor 1011, but upon reading the instructions more carefully I realized that this petal starts with the next lightest, Anchor 6. So out it all came and now you can see how far I've progressed. Luckily this is a sturdy cotton fabric and can withstand picking threads out of it. Today is a beautiful Saturday in Southern California (aren't they all? ), and I hope to get in some stitching time in between bouts of gardening. It's time to get those tomatoes planted! Tomorrow is Easter Sunday and I hope all of you who celebrate it have a wonderful day. I've been asked to post some photos of our trip last month to London, so here is the first. It was taken with my iPhone and I'm amazed it came out so well with not too much glare. And by the way, I'll try to make most of them textile related. This is the double headed serpent made of wood and inlaid with turquoise and white and red shells. Serpents were sacred and were considered to represent the feathered serpent god Quetzalcoatl. You can read about it at the British Museum Website page Double Headed Serpent. Note that the images are copyrighted by the British Museum. So I'm sure you're asking, how in the world is this textile related? If you go to the website of Ruth O'Leary and click on this post from December 2009, you'll find how she interpreted this design in leather applique and goldwork. This post is the last one in the series, so you can go backwards and see how it all came together. Ruth is currently working on a huge project, the Saint Cuthbert's Banner. Take a look at it - it's fascinating to see the progression. Now I'll share a couple of photos that are not textile related, but are interesting nonetheless. 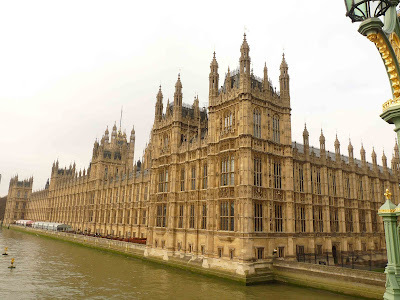 This is a view of the Houses of Parliament from about 1/3 of the way on the bridge over the Thames. You can just see a bit of the post on the right. I noticed a dark shape in what looked like an open window and asked my husband to take a picture. 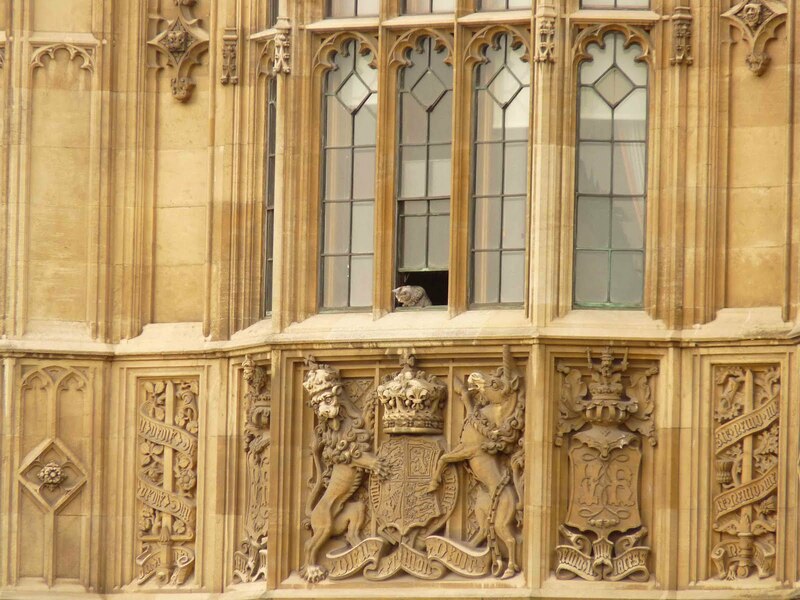 When he zoomed in, we found this cat looking at all the birds flying about! I can't imagine a cat living in that huge building. We couldn't go in as they don't let foreigners in the building, and there were guards all about. This was definitely our best vacation photo. I have to admit I am really enjoying this project. 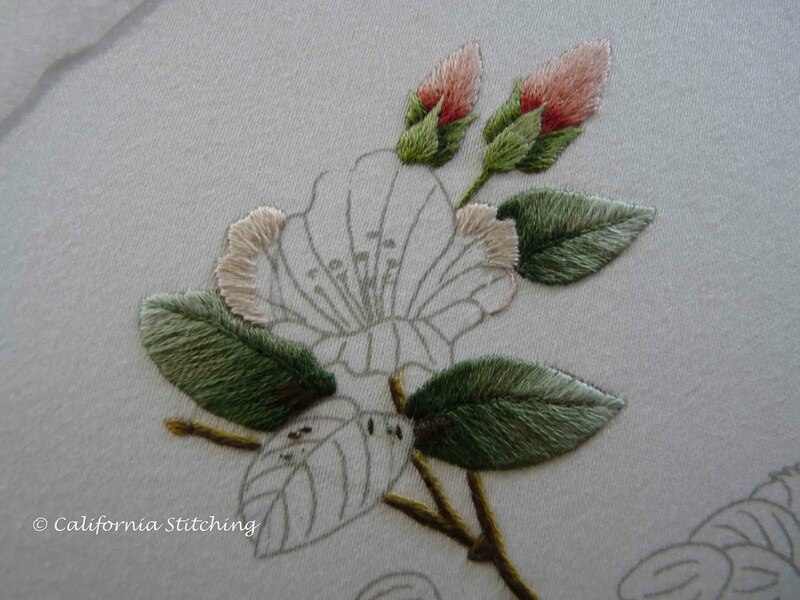 It is difficult using so many threads for one small piece, but that is what makes it look so lifelike. 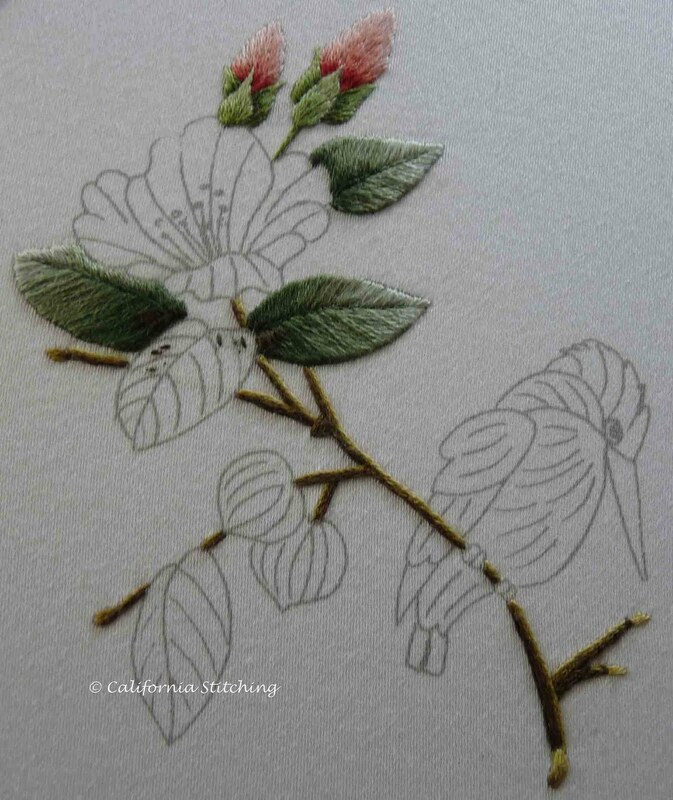 The two lower leaves used six shades of green plus a bit of brown for the really deep shadows. The stem used five shades of beige/brown. Trish Burr, our teacher, says I'm progressing well and can continue to the next lesson. This will be the flower, so it should really be fun. Please visit Trish's website for some really amazing photos of her work. You can buy kits in the US from Nordic Needle. There are also a few free projects on her website to whet your appetite for more. 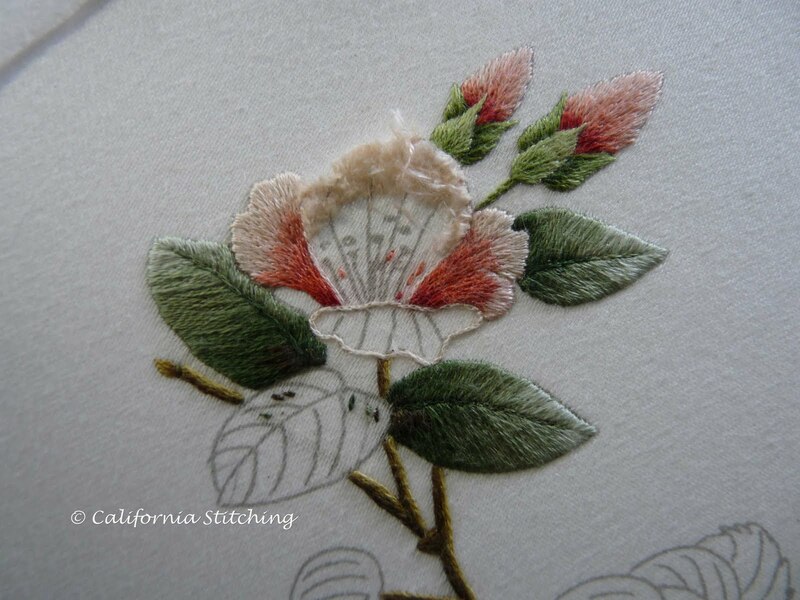 It's a beautiful Saturday morning here in Southern California, and I won't get much stitching in today. 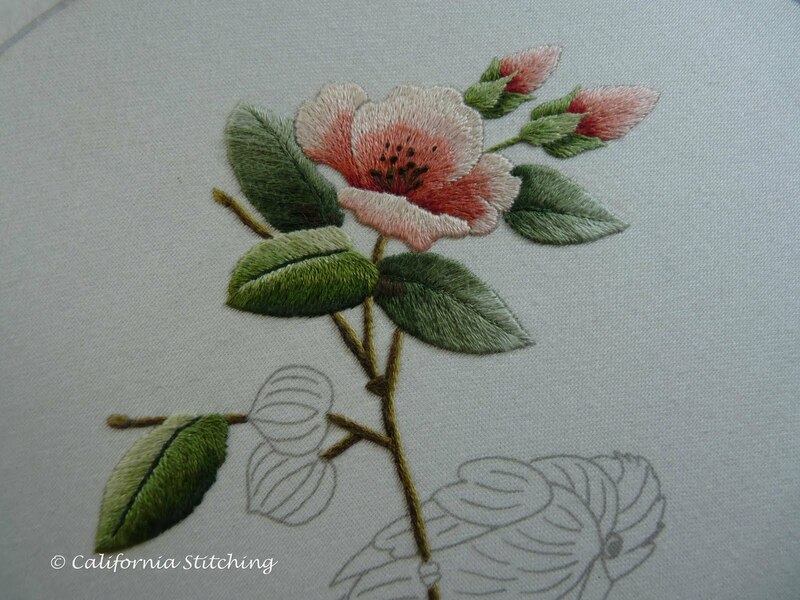 I'm off to meet my sister, her daughter and our mother for lunch, then to Needlepoints Ltd., in Garden Grove. I just feel the need to buy some silk threads, so I'll put together a couple of kits to work on from Susan O'Connor's Embroidered Flowers for Elizabeth book. If you're not familiar with this book, please read Mary Corbet's review. Then you'll really want it! It's available from Amazon, Book Depository, and of course, from Country Bumpkin, the publisher. I completed the Silver Swirls project and want to share some observations about it. I found that when adding the bright check purl, it helps to run the piece of purl down to the base of the thread next to the fabric, then pull the thread through. This enables you to place it precisely where you want it. Now this may seem pretty obvious, but as I'm new to goldwork, it wasn't to me. And here it is, all finished and waiting to be framed! So, what are the likes and dislikes? It was a pretty simple project, in fact, maybe a bit too simple. Our class was 5 hours long, and I'm used to the 6 hours we generally have for classes here in the US (and Australia). I would have liked something a bit more challenging. Still, the class was enjoyable and taught by a very capable and engaging teacher. 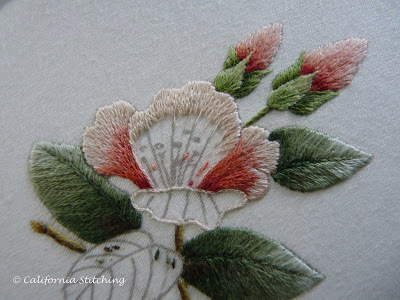 This class had the basics, some thread shading, couching and using pearl purl and the bright check purl, so it did cover several new techniques. I learned quite a bit, and am now ready to break out a goldwork project that I've had waiting in the wings (for a couple of years now), the Golden Pomegranate from Inspirations Issue No. 61, back in early 2009/late 2008. Mary Corbet from NeedlenThread.com worked this kit and posted about it, and so will I some time in the not so distant future. 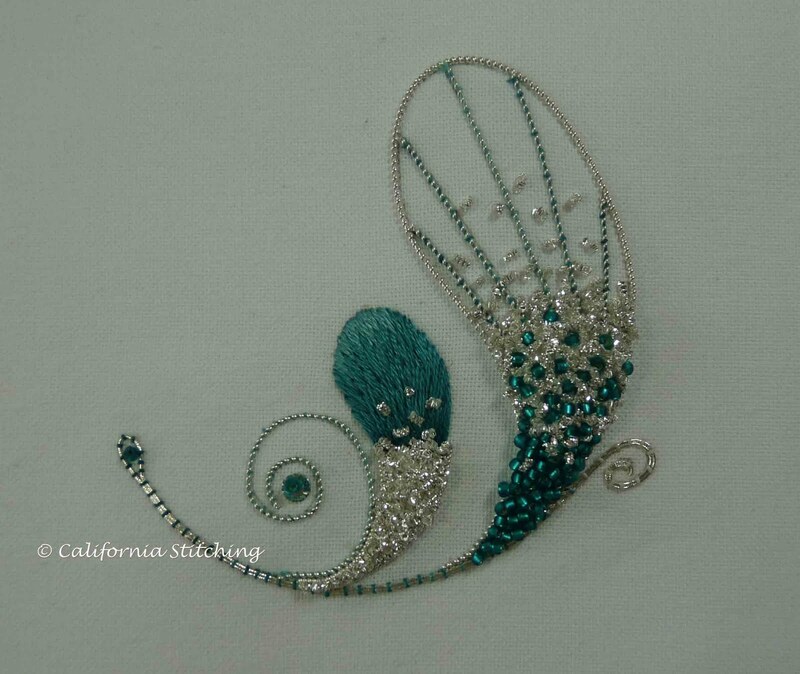 In all, it was a fun class that I enjoyed very much, and am looking forward to trying my hand at more goldwork. 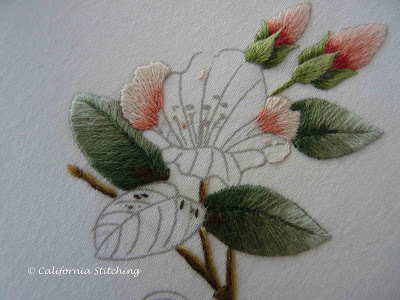 Next I'll write about Lesson 2 of the Chinese Flower Project. OK, so I didn't do a whole lot more than what I showed you in the last post, but at least I got through Lesson 1 of the Chinese Flower Project. I completed the sepals, added the first leaf, and went back to the larger bud and added a bit more of the darkest color to make the shading a bit more graduated. And notice, that I managed to create a watermark to add to the photos, something I've been meaning to do for a while now. I realize that I'm not very good at stating that many of the photos I post are copyrighted to someone other than me, and I plan on doing better in the future. This is my start on being a better sharer of photos on the internet. I've sent this off to Trish Burr, our teacher, and am anxiously waiting for her comments. I hope she isn't too harsh, but I do want honest feedback. I know that the buds should be a bit darker as you can see in the photo that was supplied with the kit. But that's life, and I'll try for more accuracy as I progress through the kit. It's turning out to be great fun. PS. I have heard back from Trish, and my work is OK, and I'm cleared to go to Lesson 2. I will probably post about this lesson over the coming weekend. Stay tuned! Here I have added the No. 1 pearl purl and stitched it completely in place. Now all that's left to do is to add wrapped super pearl purl to the inside of the large swirl and cover up the padded section with beads and bright check. It looks as though there will be a lot of materials left over, so I'm trying to decide what I can add to complement the design. Ugh, this is the painful part for me. Maybe a nice border? It is late at night and I'm the only one up in the house, and only because I forgot to do my laundry and really need to do so before setting off to work in the morning. I'm sure you are all saying, how do you figure that 9:30 is late? But when you wake at 5 am it is pretty late. So I'm off to bed shortly, but it certainly is nice having a quiet house to oneself. If I could only stay awake long enough to enjoy it. 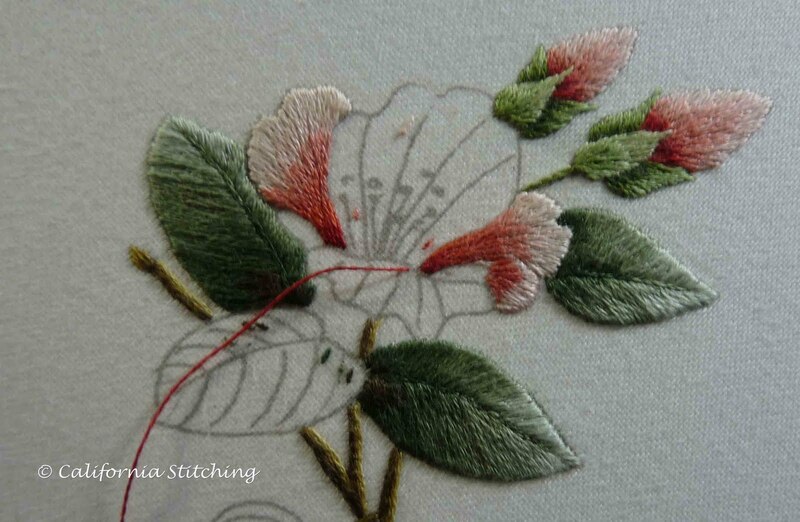 Have a good, productive, stitching week! It's Friday night and I've survived my first week back to work after vacation, and was it ever brutal! It's too bad I really need that day job to feed the stitching habit, and the eating habit, and the roof over the head habit, well, you get the idea. So here is my progress to date on Lesson 1 of the Chinese Flower Project. 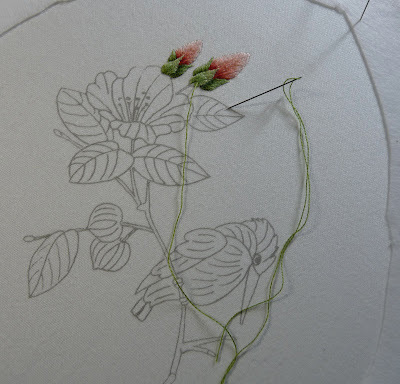 I have completed the flower buds and am making good progress on the sepals. 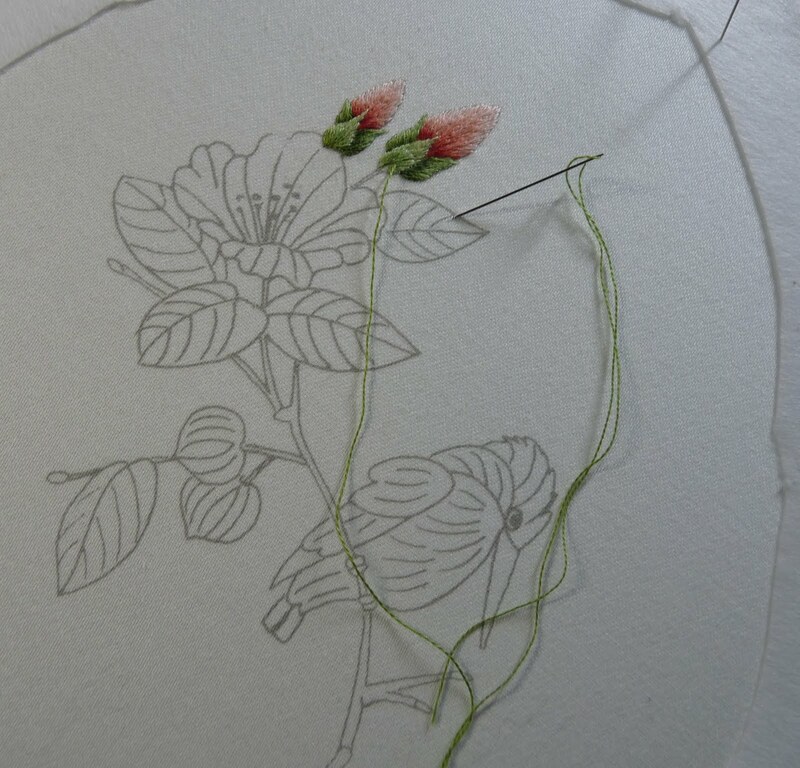 I am not entirely satisfied with the shading of the larger bud and have positioned the needle to show you. I will add a few more stitches of the darkest color to blend in a bit better. 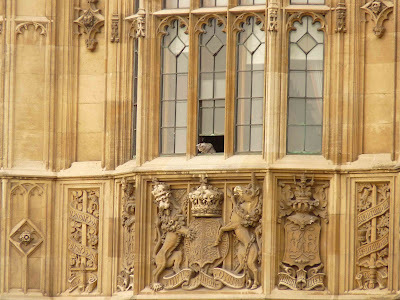 Here is the very same view, with the needle pointing (or stabbing!) the leaf. Stitching this will complete Lesson 1. Well, I do have a bit more shading to add to the center sepals first. Then I'll take a photo and send it off to Trish, our teacher, for her critique. I hope it's not too bad! And now some advice for all you young moms out there: teach your children to cook! I know, this is not embroidery related. But my son is home from work and is cooking, so the most intriguing aromas are drifting up to the computer room as I write this. It's time to go see what's up in the kitchen. I should be able to finish Lesson 1 on Saturday and make some progress on the RSN goldwork project. At least I certainly hope so! Upon our return from London I found a Post Office form in the stacks of mail that had accumulated informing me to pick up a package. It was the kit from Trish Burr's online correspondence course. Finally! I have to admit, this is the most professional kit I've ever purchased. Look at the book - it's covered beautifully with a photo of the project and it's even bound. Usually the instructions are just stapled. And notice the extra photo on the left. This is an accurate photo of the project so we can see what the colors should look like. This is a close up of the design printed on the fabric. Everything came neatly packaged in plastic, with not a wrinkle in it! And here is my jumble of threads. Trish worked this project using Anchor threads, but gave us a conversion to DMC threads. As I have all of the DMC threads I could have used them, but I decided to go ahead and get the Anchor threads as this is a learning experience for me. As I mentioned in a previous post, I drove to Laguna Beach, only about 20 minutes away, and purchased the threads in a lovely shop called Strands and Stitches, right on Pacific Coast Highway. What a nice excuse to visit the beach! I also purchased Trish's DVD and watched it, and hope to make a start on Lesson 1 this week. 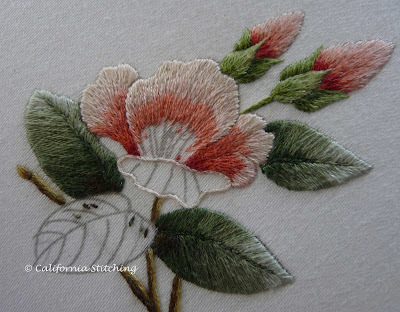 We have to stitch the rose buds and leaf in the top left hand corner. I still haven't decided whether to mount it in my large sit-upon hoop or in a frame. This project is called "Silver Swirls" and is designed by Lisa Bilby, a RSN teacher (or tutor, as they say in the UK). Please check out her website, as she does hold classed elsewhere in the UK on occasion. Here are the threads and some green beads that came with the kit. Notice the DMC cotton floss. This is a beginning class so cotton is used instead of silk. This closeup shows a bit better the progress I made while in the class. 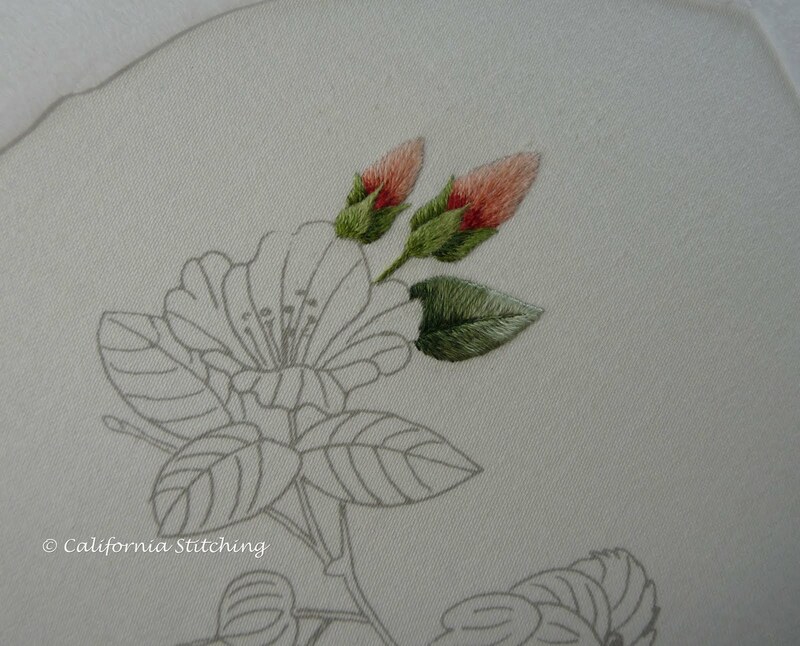 The kit came with the design drawn in pencil on cotton muslin. The first thing we did was to cut out the felt shapes and stitch them onto the design with stab stitches, coming up in the felt and going down just on the outside. This prevents the felt from getting ragged and results in a nice, clean border. It sounds obvious but I never even thought about it before. We made pretty good progress on the long and short stitch, couched down the silver plated smooth passing thread and the super pearl purl, and added a bead to the tip of the passing thread. 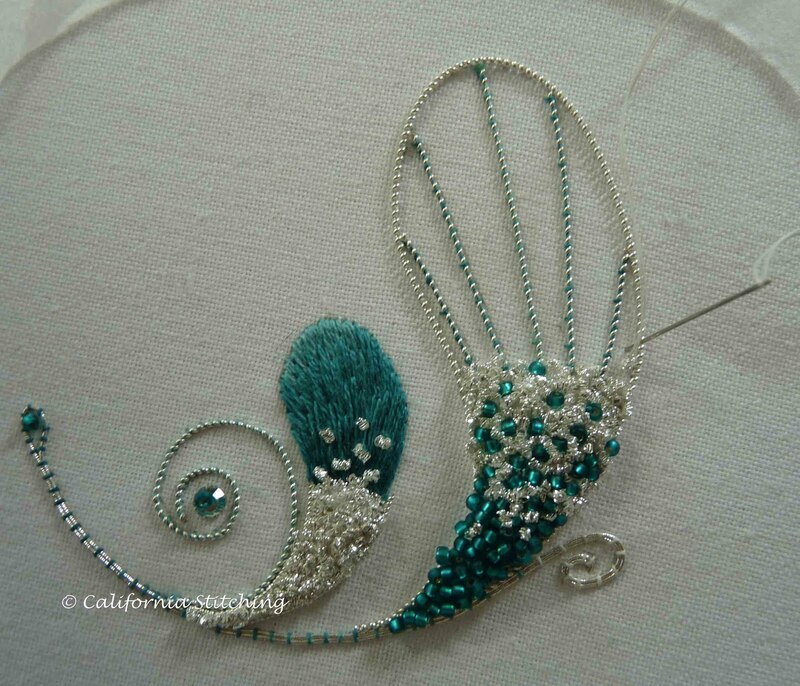 The pearl purl was slightly stretched and couched with silver sewing thread on each side of the little paisley shape. Then we overstretched it and wrapped one of the green embroidery threads around it, and couched it with the same thread to make the swirl on the left of the small paisley. I've managed to add a bit of the bright check to the small padded shape. 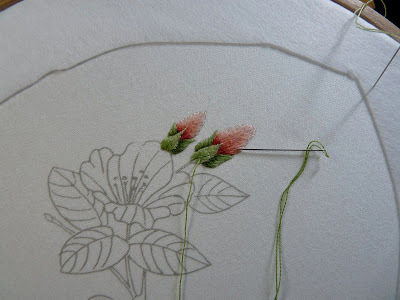 I have only used two of the green threads on the long and short stitch so far. I'll add the darker color as soon as I can get to it. Our teacher had us use two strands of floss for this, something I've never heard of before. 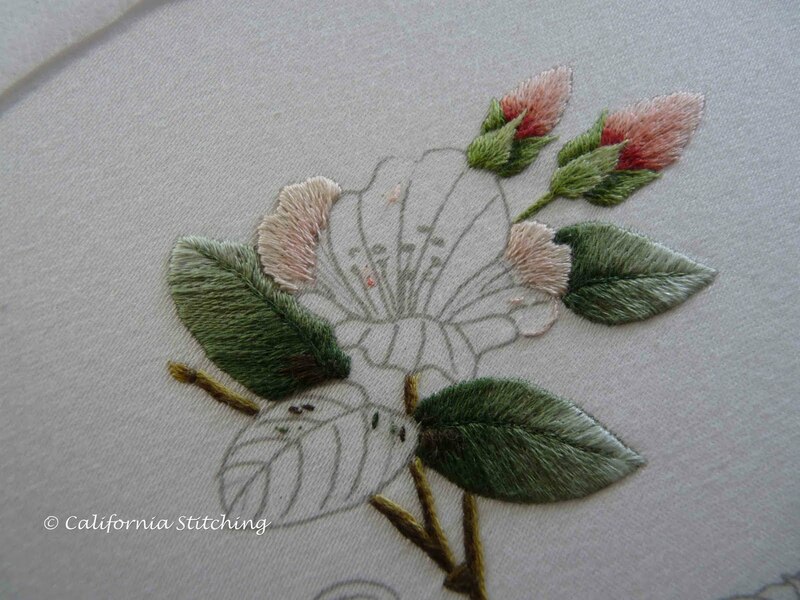 I've always seen long and short stitch (or needlepainting, or silk shading) worked with one strand. It looks good here, though. The venue for the class was simply amazing. It was at Hampton Court Palace where Henry VIII once lived. As you can see, the daffodils were riotous!